Employers can be very selective in choosing the right person for the job and they are increasingly looking for those who have the right qualifications, skills or experience. Having studied the Legal Secretaries Diploma course or being an ILSPA Member gives you a great advantage, but there are many other factors which must be taken into account when looking for work. Applying for a job should be planned carefully. Those who are well prepared will secure the best positions. A good way of going about your job search is to imagine you are employed in the business of finding yourself a job. You need to organise and plan each step of the way to secure the right position. To successfully obtain a job, you must market yourself. You must think that you are the product and the prospective employer is the customer. Just as any business has to market its products in order to obtain sales, so you must market yourself in order to obtain a job. Start your job search with a positive attitude and you will succeed. Make sure that you have confidence in your abilities and worth. Your attitude will affect the outcome and make all the difference in your achieving your goal. Your CV is the first chance you get to make a good impression on a potential employer and it is your personal selling proposal. A top-quality CV will considerably boost your chance of getting a face-to-face interview, so it is worth spending time and effort on the content and presentation. It will make all the difference in obtaining the position you want. You must therefore highlight your skills, expertise and value. ILSPA Members are able to obtain step-by-step CV help from us. This guidance will prove to be invaluable in your job search, as you will be presenting your skills, qualifications and experience in a manner that will be attractive to employers. You must pay special attention not only to your CV, but also to the covering letter that should be sent with it. One way to look at your CV and covering letter is to consider the CV a product and the covering letter an advertisement for that product. Some say that the covering letter is just as important as the CV. Employers can receive many applications for a job vacancy that has been advertised, and sometimes only a glance is made at the letter and CV. You therefore need to draw attention, create interest, produce desire and encourage action. An employer is interested not just in you but also in how the organisation can benefit from employing you. Ask yourself the question ‘Why should a firm employ me?’ Think about what you can offer that other candidates may not be able to, and make this clear. You will be looking for a job that will either start or advance your career. Look at what skills, qualifications and experience you have and decide what job you are capable of. This will become evident after you prepare your CV and take a look at the different vacancies. There are many different positions available for Legal Secretaries. Some employers may require someone with experience, whilst others will be willing to employ someone with a good legal secretarial qualification and secretarial skills. If you have just qualified from the Legal Secretaries Diploma course and have no previous experience, it is important to keep in mind that everyone has to start somewhere and every experienced Legal Secretary was once inexperienced, the same as you. With a positive attitude and determination you will achieve your goal. Many of our students manage to obtain Legal Secretary jobs which ask for experience, on the strength of the Legal Secretaries Diploma and by explaining to potential employers what they have learnt on the course. If, at first, you decide to apply for a position that is not necessarily your ideal job, try to appreciate that it will allow you to gain experience on which you can build your career. In time you will have the skills and experience necessary for your ideal job and be able to move on. You may have previously worked as a Legal Secretary and have gained experience in certain areas of law. It is beneficial, therefore, to decide whether you would like to work in those areas again or whether you would like to move into a new area. We provide Single Subject Courses for people who would like to specialise in one area of law, so please contact us for details if you are interested in furthering your studies and qualifications. Salaries for Legal Secretaries can vary widely, depending on the level of the position, where you work and the area of the country you live in. When you start looking for work, you will find out what kind of salary to expect. Our jobs board and recruitment partners hold many different vacancies for Legal Secretaries throughout the UK, so you will be able to get an idea of average salaries in your area by doing a search. View your applications and saved jobs. The recruitment section of our website also features our recruitment partners such as simplylawjobs.com and totaljobs.co.uk. These companies are very keen for our Members to register with them, and you can upload your CV so that you are informed of any new vacancies and employers can contact you. Please view their websites and apply for any positions which are suitable. Vacancies are updated on a regular basis, so it is good to check their websites regularly to see what they have available. Some vacancies are never advertised, so it can be very beneficial to contact law firms directly to ask them if they have any suitable positions available. Many law firms invite speculative applications from people who think that they have something to offer the company. You can do a mail shot by post or email, sending your CV together with a covering letter, to several different firms to increase your chance of securing a job. You can find firms in your area by doing a search on the Internet, for example, ‘law firm victoria london’ or ‘solicitors victoria london’. It is common for law firms to have recruitment sections on their websites where you will be able to find the relevant contacts, postal and email addresses. Many of our Members have found this to be a successful way to secure employment. If you are interested in working for a large firm, you can find a list of the top 200 UK law firms on Wikipedia at http://en.wikipedia.org/wiki/List_of_largest_UK_law_firms. When you are offered an interview, it means that your CV has made a good impression. You need to prepare yourself to make sure that you make the best of your opportunity. It is important to remember the purpose of the interview. It provides your prospective employer with an opportunity to judge your suitability for the job and assess you in relation to other candidates. It is also your chance to find out more about the job. It is beneficial to list four accomplishments which you are especially proud of. Choose two of these accomplishments and write down a paragraph about each one. Make sure that you state the qualities and traits that allowed you to reach those accomplishments. This exercise will serve a very practical purpose in that it will give you a higher awareness of your qualities and a well-planned response to use during your interviews. Which personal qualities and traits do you possess? There are many skills and qualities that someone may have, so you have to decide what yours are. Are you motivated, trustworthy, well organised, confident, loyal, flexible, diligent or decisive? Self-assessment leads to self-confidence. You must be confident and also be knowledgeable about yourself in order to sell yourself. Do you know yourself as well as you should? Can you present your strengths and weaknesses in a concise and confident manner? Think about what questions you may be asked in the interview, and make sure that you are prepared to answer anything in a confident and assured manner. If you have completed the Legal Secretaries Diploma, it is a good idea to take your portfolio with you to show what you have learnt on the course and how capable you are of doing the work required. What qualifications do you have to work as a Legal Secretary? What did you enjoy most about studying your Legal Secretary course? What specific skills do you have that would help our firm? What would you expect to do as a Legal Secretary? How much experience do you have as a Secretary or Legal Secretary? Why do you want to be a Legal Secretary? How would you evaluate your performance in your previous/current job? 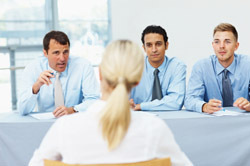 You may want to think about questions to ask when you attend your interview. It is important to be interested and ask as much as you can about the position offered. This will give your prospective employers an impression of your enthusiasm for the job. Before leaving the interview, establish what the next step will be. Make sure that you know when you can expect to hear from the firm and what will happen next. You will discover that overall a positive and confident attitude will take you far. You will have strengths and weaknesses like everyone else, so do not be afraid to address both. Preparation is essential to an effective job search, and success can be yours. The March 2009 edition of our journal features an inspiring article from one of our Student Members who successfully gained employment as a Legal Administrator. She shows that with the right attitude and determination you can achieve your goal, and we hope that this will be of encouragement to you. Good luck!